The Upper Mississippi River Restoration (UMRR) Program Long Term Resource Monitoring (LTRM) element has collected millions of records of information over 20+ years. Fisheries, water quality, vegetation, and invertebrates have all been sampled. Geographic locations were collected for all sampling points. This information has been available in data tables via the data download tools, but has not been available to scientists, resource managers, and the public via an internet-based mapping and query application. Spatial data query tools were developed that allow the query, display, mapping, and data extraction of UMRR LTRM element component data using an easy-to-use graphical user interface. 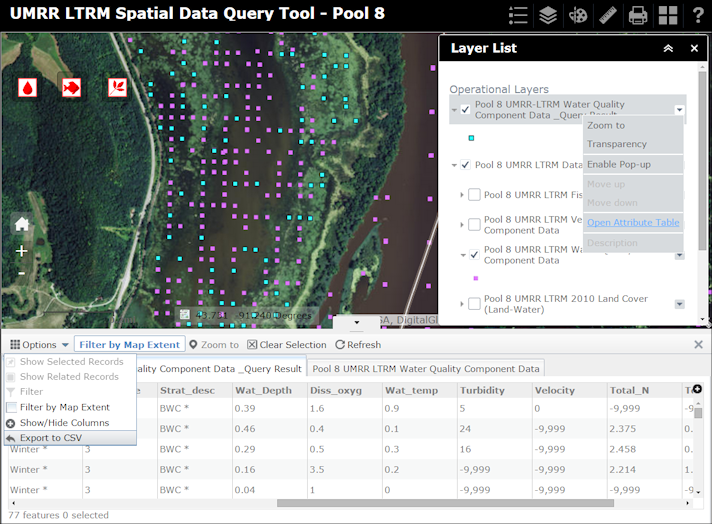 A separate spatial data query tool application was developed for each study reach within the Upper Mississippi River system. In addition to the UMRR LTRM element component data, the spatial data query tool also contains land cover and bathymetric data collected by the UMRR LTRM element. UMRR LTRM element component sampling data is available to query using the Water Quality , Fisheries , and Aquatic Vegetation query buttons. Performing a query at the full extent of the study pool may return a large number of feature results, the more results returned, the longer the query will take. A query that takes over 1 minute may cause the application to crash. It is recommended to limit queries to a smaller spatial extent or to limit the results via a more specific logical query. Detailed instructions on using the tools are available by selecting the help button on any of the spatial data query tools linked below.